There is a race going in the global lithium market right now. It is the competition among a number of mining firms to see who will be ready to enter with qualified lithium production as the market is gripped by a supply deficit coupled with a substantial demand increase. With the use of lithium as a key component in lithium-ion batteries, the batteries which will underpin the whole electric vehicle and battery storage industries, the price is going to increase and supply is going to be constrained for the next several years at least. Nemaska Lithium has spent eight years progressing the world class Whabouchi project in Quebec and has developed a unique production process to ensure it enters the lithium market as one of the lowest cost producers. Nemaska Lithium has developed the Whabouchi project into what CEO Guy Bourassa calls ‘one of the largest and richest spodumene deposits in the world’. Everything is in place for Nemaska Lithium to capture the boom in lithium demand in the coming years. All the environmental permits have been signed as well as the impact benefit agreement with the First Nations and now the company is ready to go forward with a feasibility study. As well as having a truly world class deposit, Nemaska Lithium has also decided to become a fully integrated supplier from the mine to the end products, lithium hydroxide and lithium carbonate. Nemaska Lithium has signed two deals with major players in the lithium battery and production space. Johnson Matthey Battery Materials (JMBM) and FMC Lithium will off-take approximately 50% of the production from the hydromet plant in Shawinigan, Quebec and Nemaska Lithium has recently taken a major step in making that a reality. The crucial step for those contracts to be validated has just been completed. In early May Nemaska Lithium announced JMBM approved the first commercial sample of lithium hydroxide from the phase 1 plant in Shawinigan, a small commercial plant used for qualifying the end product with potential customers.. The project itself is split into two sites, the hydromet plant site in Shawinigan which comprises the phase 1 plant and the large scale commercial plant, and the mine site near the town of Nemaska to the North. Bourassa is confident that the mine site has all the necessary infrastructure in place to be a success. The location is perfect, the CEO says that within 30km of the mine site there is all the infrastructure necessary to start and operate a mine. Close to civilisation in Nemaska with lodging capabilities for employees, an airport just 18km away, existing railways and most importantly two government-owned hydroelectric substations. The availability of power transforms the capex of the project. The only infrastructural investment necessary is to install a 13km hydroelectric transport line from the substations to the mine and in addition electricity is low cost in Quebec. Furthermore with Shawinigan’s history of providing the electricity to power Montreal there is a longstanding supply chain and localised skill labour force for Nemaska to take advantage of. The Cree Community of Nemaska will provide around 25-30% of the total required manpower of 130 employees for the mine site, while the remainder are likely to come from Chibougamau and surrounding areas according to Bourassa. The Whabouchi project is permitted to mine 1.1 million tonnes (mt) of ore per year for the next 26 years, that will be concentrated down to around 213,000t of spodumene concentrate which will be transported down to the hydromet plant at Shawinigan by road and rail. However, having the infrastructure in place is only one of the central planks necessary to be successful in the lithium space. The other two fundamental advantages Nemaska Lithium has up its sleeve are the grade of the ore and the unique processing technique to convert spodumene into lithium carbonate and lithium hydroxide. The latter particularly is what will differentiate the company in the market and enable it to compete with Chinese counterparts on price. The spodumene concentrate will contain 6% lithium oxide, a grade suitable to be converted into high grade lithium hydroxide and lithium carbonate necessary for use in lithium ion batteries. The fact that it can be predominantly mined from an open pit scenario adds to the reduced costs of production. There is no tantalum or niobium in the ore so the recoveries will be stronger and the stripping ratio is low. With Nemaska Lithium converting the spodumene in Quebec it will have a large cost advantage over Chinese competitors because it owns the resource and the logistics are simpler thanks to not having to import any raw materials. Nemaska Lithium’s unique chemical process replaces the conventional technique of adding costly soda ash to lithium sulphate to transform it into lithium carbonate. Instead, Nemaska Lithium is using a process of electrolysis to produce the lithium salts and the results are transformative for the project economics. The processing technique will also allow Nemaska Lithium to reuse the available sulphuric acid in the process. Bourassa says, “We therefore reduce the need for sulphuric acid by about 75%. You don’t need to neutralise the weak sulphuric acid at the end, you don’t need lime to do that and you don’t have to take care of any waste products that would have otherwise been produced. The combination of a low capital expenditure, high grade ore at Whabouchi and the innovative processing technique will see Nemaska Lithium enter the market with a distinct cost advantage over the major industry players. However, it is the quality and grade of the lithium carbonate and hydroxide that attracted the offtake agreements with JMBM and FMC. Bourassa says the fact that Nemaska Lithium was able to sign these two agreements with companies of this size is the strongest reflection that the process is going to be a success and there is a belief in Nemaska Lithium’s ability to deliver strong long term supply. The first agreement with JMBM is for the battery cathode manufacturing firm to supply lithium sulphate that Nemaska converts into lithium hydroxide for use in the production line. “It’s a service agreement which is based on the phase 1 plant. That’s why they agreed to put in $12 million as an up-front payment to help us build the plant and help them regenerate lithium hydroxide from their by-product of lithium sulphate. Nemaska Lithium’s agreement with FMC has raised eyebrows as it will be selling product to the largest lithium hydroxide producer in the world. While FMC has a good conversion capacity of carbonate into hydroxide it cannot source enough lithium carbonate in the market so it needs to shore up long term supply. 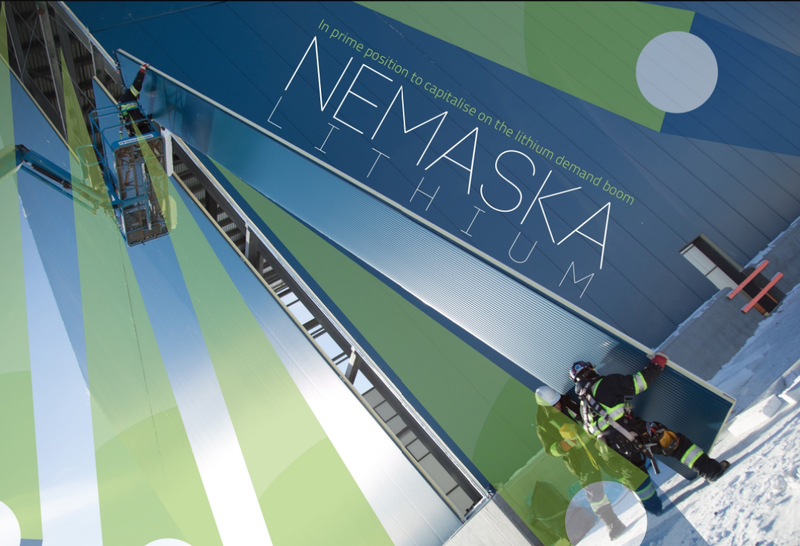 Both agreements, and the accessibility to funding they bring, are crucial for Nemaska Lithium. As it stands it is still a single asset company, with no revenue yet and in a metal where there is little price transparency. Bourassa had to have a good qualification of the company’s capacity to sell to credit-worthy clients, as he has done. Bourassa cannot stress enough the importance of the lithium hydroxide and lithium carbonate at Whabouchi being qualified prior to commercial production. Any new lithium producer who wants to sell a lithium salt will have to factor in 12 months of product testing by end users, to ensure the product stands up in engineering. Nemaska Lithium has reduced this lead time by commissioning the phase 1 plant and thereby incorporating the product qualifying process into the construction and commissioning phase of the project development. “We have to remember that it’s important to come to market but it’s more important to qualify your product. One of the reasons we built the phase 1 plant was to shorten the period it usually takes to qualify the product once you have started commercial production,” explains Bourassa. “The phase 1 plant gives us two advantages. The first is we can engage and discuss the specifics of each client we are talking to and secondly it gives us at least a one year advantage on anyone who is going to build a commercial plant directly. With the phase 1 plant in place and proving the quality of the product all that is left for Nemaska Lithium is to commence construction of the mine and construction and commissioning of the hydromet plant to commercial production of lithium hydroxide and carbonate. However, to do that there is still a considerable amount of financing to find. Last summer the company graduated from the TSX Venture Exchange to the TSX main board and raised C$69 million, through a public offering – $50 million of that was earmarked to advance the commercial phase of the project. Nemaska also attracted 32 new institutional investors, some coming from interesting funds. “We had some very large institutional investors in natural resources funds but also clean tech funds, which shows the market realised we were not a mining company anymore but more of a green chemical company,” Bourassa observes. The project will require around $500 million in capital to construct the mine and the hydromet plant. The company aims to do a 60/40 split of debt to equity, which Bourassa says is progressing well. It is no surprise that Nemaska Lithium is attracting such widespread attention from both the investor and end user market. It has all the permits in place, a major hurdle to commercial production, high grade ore, low cost entry to production and institutional and end user backing. All the key ingredients are there to develop a world class lithium. Bourassa says the facts that the project is fully permitted, fully integrated from the mine to the end product and could be in production in the next two years really sets it apart from the majority of potential lithium projects. The next two years will be a crucial period for Nemaska Lithium and it could be a major player in global lithium production if all goes well.